The mini table version of this game functions the same as the full version except that the table is smaller and in the shape of a half circle. Because of its size, there is only room for up to 7 players to join in a mini baccarat game. 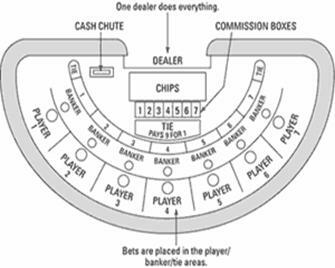 The callers place is at the head of the table where the dealer can face all the players and the commission boxes are printed right in front of him/her so they can easily keep track of the commissions. The betting areas are laid out in the same form as the full table, player bet, banker bet and tie. These tables are found on the casino floor and attract the average baccarat player. Minimum bets as low as $2 - $25 can be easily found in this version however maximum bets can go as high as $5000 a hand.